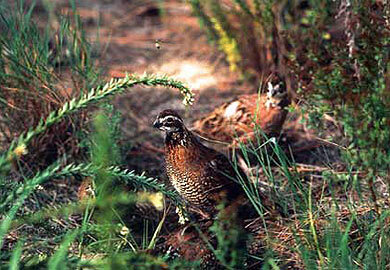 HOW YOU CAN HELP SOUTH CAROLINA'S QUAIL POPULATION . . .
Focal Regions, covering almost 9 million acres of land that hold the highest potential for quickly growing coveys of bobwhites. Your tax-deductible contribution will be deposited in a subaccount of the Hampton Wildlife Fund, a 501 (c)3 non-profit organization, and will be expressly used in support of the South Carolina Bobwhite Initiative. Charge cards may be used by clicking the "Donate Now" button at upper right. Checks should be made to Hampton Wildlife Fund. Please do not mail cash. Donate securely with your credit card by clicking the box above.